Essaouira, 모로코의 호텔 데 일에스 | 호스텔월드에서 예약하세요. The hotel is situated on the located strategically main principal sea-front avenue at the entrance to the old city and is opposite the sea and port. Perfect location for those who want to discover the richness of the city. Please note: the Hôtel des Iles is a smoke-free hotel. The Hôtel des Iles built in 1948 by Antoine Marchisio (designer of the legendary Mamounia in Marrakesh), combines the Moorish and retro styles of the period with all modern amenities. The property has 3 different restaurants. The AYLAL restaurant on the 1st floor with a panoramic view of the sea, the CAP COD : on the second floor a panoramic view of the sea and the Isselmane. Three bars are also available onsite, the Amlal (snack-bar) and Amrag (Ameriacn style bar). Orson Welles Bar is a beautiful small private bar with « retro » decor, a reminder of Welles’long stays at the hotel during the filming of the Cannes Golden Palm winning film, « Othello ». 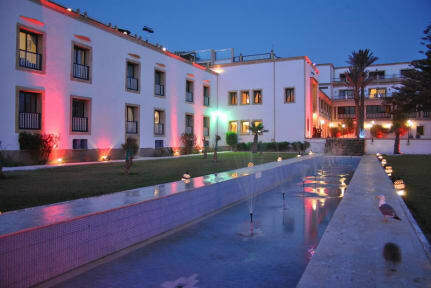 This family-friendly Essaouira hotel is within a 10-minute walk of Place Moulay el Hassan, Mohammed Ben Abdallah Museum, and Skala du Port. Essaouira Beach and Skala de la Ville are also within 15 minutes. Many other attractions and activities are available near the property. For more information, please do not hesitate to contact the property. The Hôtel des Iles offers rooms with free WiFi access, balconies, and TVs with satellite channels. Guests will also find 24-hour room service, free local calls, and hair dry. 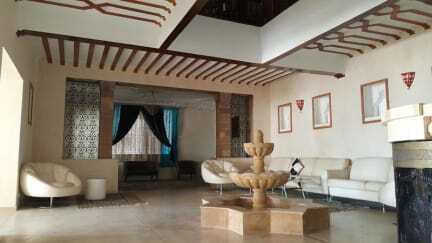 The property is composed by 68 rooms and 12 suites. 33 rooms have recently been renovated and redecorated. Please note: the property does not accept American Express and Travel Checks. Taxes not included - Local occupancy tax 16.80 Moroccan Dirham (approx.1.6 euros) per person per night.